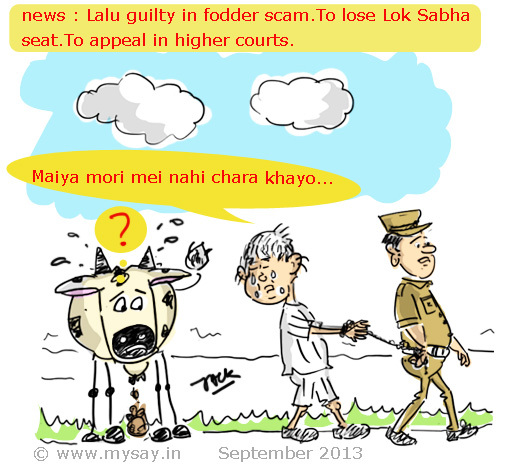 After 17 long years, Court’s decision on Fodder Scam has managed to shake RJD Supremo and former Chief Minister of Bihar, Lalu Prasad Yadav. He is found guilty. This decision will make him lose his Lok Sabha seat.However, RJD maintained that Lalu was a victim of political conspiracy and that the party will challenge the verdict in higher courts.His disqualification from Parliament will keep him out of electoral arena for at least six years.Along with Lalu ,Congress Leader and another former Chief Minister of Bihar,Jagannath Mishra, has also been found guilty. As of now, he is taken into custody and on the 3rd of October , the quantum of punishment with be declared by the court.